The nativist blueprint for Trump’s immigration plan. A century ago, nativists won the battle over immigration. The Trump administration is determined to repeat it. The president and his allies claim such an immigration policy would promote cohesion and unity among Americans “and finally bring our immigration system into the 21st century.” Far from forward-facing, however, the president’s policies evoke the beginning of the 20th century, when war abroad and opportunity at home brought waves of immigrants to the United States, from Italians, Polish, and Russians to Chinese and Japanese. Their arrival sparked a backlash from those who feared what these newcomers might mean for white supremacy and the privileged position of white, Anglo-Saxon Americans. Those fears coalesced into a movement for “American homogeneity,” and a drive to achieve it by closing off America’s borders to all but a select group of immigrants. This culminated in 1924 with the Johnson-Reed Act, which sharply restricted immigration from Southern and Eastern Europe and all but banned it from much of Asia. The cohesion Trump espouses isn’t national or ideological. It is racial. The fight over immigration isn’t between two camps who value the contributions of immigrants and simply quibble over the mix and composition of entrants to the United States. It is between a camp that values immigrants and seeks to protect the broader American tradition of inclusion, and one that rejects this openness in favor of a darker legacy of exclusion. And in the current moment, it is the restrictionists who are the loudest and most influential voices, and their concerns are driving the terms of the debate. In the first decades of the 20th century, the defense of “the principle of nationality” took several forms. At the level of mass politics, it meant a retooled and reinvigorated Ku Klux Klan with a membership in the millions, whose new incarnation was as committed to anti-immigrant, anti-Catholic, and anti-Semitic politics as it was to its traditional anti-black racism. In Behind the Mask of Chivalry: The Making of the Second Ku Klux Klan, historian Nancy MacLean notes how Georgia Klan leader William Joseph Simmons warned his followers that they were, in his words, “being crowded out by a “mongrel population … organized into Ghettos and Communistic groups … and uplifting a red flag as their insignia of war.” Likewise, Klan leaders and publications blasted Catholic immigrants as “European riff-raff” and “slaves of ignorance and vice” who threatened to degrade the country at the same time that they allegedly undermined native-born white workers. When, in 1923 and 1924, Congress was debating the Johnson-Reed Act, the Klan organized a letter-writing campaign to help secure its passage, turning its rhetoric into political action. At the elite level, it meant the growth of an intellectual case for nativism, one built on a foundation of eugenics and “race science.” Prominent scholars like Madison Grant (The Passing of the Great Race) and Lothrop Stoddard (The Rising Tide of Color Against White World Supremacy) penned books and delivered lectures across the country, warning of a world in which “Nordic superiority” was supplanted by those of so-called inferior stock. “What is the greatest danger which threatens the American republic today?” asked eugenicist Henry Fairfield Osborn in the preface to Grant’s book. “I would certainly reply: The gradual dying out among our people of those hereditary traits through which the principles of our religious, political and social foundations were laid down and their insidious replacement by traits of less noble character.” The aim of the nativists was to preserve those traits and admit for entry only those immigrants who could fully and easily assimilate into them. The Johnson-Reed Act codified this nativism into law. The “national origins” provision set quotas limiting the number of immigrants from a given country to 2 percent of the people from that country as of the 1890 census, rather than the 1900 or 1910 census. In calculating those quotas, it excluded immigrants from within the Western hemisphere (primarily those from Mexico, Central, and South America) and their descendants, as well as black Americans, and all Chinese, Japanese, and South Asians, holding the latter as racially ineligible for citizenship. The cohesion Trump espouses isn’t national or ideological. It is racial. Choosing an earlier census ensured a low baseline for foreign-born Americans. The effect was a drastic reduction of immigration from much of the world, but especially from those countries outside of Western Europe and Germany. Great Britain and Ireland, for example, received more than 65,000 quota slots in the post-1924 world. Russia, by contrast, received just under 2,800, and China received a scant 100. The 1924 law had a profound impact on racial categorization in American life. “At one level, the new immigration law differentiated Europeans according to nationality and ranked them in a hierarchy of desirability,” writes historian Mae Ngai in a 1999 essay titled “The Architecture of Race in American Immigration Law: A Reexamination of the Immigration Act of 1924.” “At another level, the law constructed a white American race, in which persons of European descent shared a common whiteness that made them distinct from those deemed to be not white.” By not precluding citizenship for European immigrants in the way that it did for Asian ones, the Johnson-Reed Act created space for an expansion of “whiteness” to groups that stood outside of its boundaries. “Euro-Americans acquired both ethnicities—that is, nationality-based identities that were presumed to be transformable—and a racial identity based on whiteness that was presumed to be unchangeable,” Ngai writes. Restricting immigration on racial lines increased the value of whiteness, tightening the connection between racial whiteness, citizenship, power, and opportunity. It’s no accident that the beneficiaries of that change—the descendants of Southern, Central, and Eastern European immigrants—would become jealous defenders of racial privileges as battles over housing, jobs, and access flared across industrial cities in the 1940s, ’50s and ’60s. President Trump and his allies in and outside of Washington have been vocal about their concern over a rapidly diversifying America. And in the same way that the authors of the Johnson-Reed Act sought to preserve Anglo-Saxon dominance over American life, today’s crop of extreme restrictionists—or at least, those with the most sway and influence—seek to stop a demographic transition that might interfere with white racial hegemony. In that, they have been backed by a conspicuous contingent of white supremacists—the self-proclaimed “alt-right”—who see the president as a kindred spirit in the fight to preserve a white nation. It is true that there are some more moderate restrictionists in the mix, for whom the drive to reduce legal immigration is driven by concern and prudence—concern over immigration’s impact on wage and employment, especially among the country’s working-class citizens, and prudence regarding our ability to assimilate and absorb new arrivals. The facts do not support these misgivings. Low-skilled immigration does more to bolster prospects for working-class Americans—providing complementary employment to construction and farm labor—than it does to lower wages. Likewise, immigrants to the United States have shown a remarkable capacity for assimilation, quickly integrating themselves into the fabric of American life by building homes, businesses, and families. To the extent that native-born workers need protection, it’s best provided by stronger unions and more generous support from the government. But those moderate voices aren’t setting the agenda. Instead, it’s the hardliners who have used their initiative to inject nativism into mainstream politics and channel, in attenuated form, the attitudes that produced the 1924 law. President Trump, for example, ties Hispanic immigrants to crime and disorder, blaming their presence for gang violence. He attributes terror attacks committed by Muslim immigrants to the “visa lottery and chain migration” that supposedly allows them unfettered access to American targets. And in a recent meeting with Democratic and Republican lawmakers, Trump disparaged Haiti and various African nations as “shitholes” (or “shithouses”) whose immigrants should be turned away from the country in favor of those from European countries, like Norway. It’s unclear if Trump is aware of Rep. Albert Johnson, who spearheaded the 1924 immigration law. But in his racial ranking of immigrants, the president echoed the congressman’s sentiments. “The day of unalloyed welcome to all peoples, the day of indiscriminate acceptance of all races, has definitely ended,” proclaimed Johnson on the passage of the bill that bore his name. The president isn’t alone in his views. Before joining the Trump administration, former White House adviser Stephen Bannon openly opposed nonwhite immigration on the grounds that it threatened the integrity of Western nations. And while Bannon has been exiled from Trump’s orbit, that legacy lives on. Stephen Miller, who is now the driving force behind immigration policy in the Trump administration, is a notorious hardliner who has echoed Bannon’s views, bemoaning the number of foreign-born people in the United States. As attorney general, Sessions has leaned in to these views. “What good does it do to bring in somebody who’s illiterate in their own country, has no skills, and is going to struggle in our country and not be successful?” said Sessions during a recent interview on Fox News. “That is not what a good nation should do, and we need to get away from it.” Rep. Steve King of Iowa, a staunch defender of Trump, is especially blunt in his defense of hardline immigration policies. “Assimilation, not diversity, is our American strength,” he said on Twitter last year. Assimilation in those middle decades of the 20th century was built, to a considerable extent, on racial exclusion. It was assimilation into whiteness, one which bolstered and preserved the racial status quo. There’s no return to the America of that era, but one could slow the nation’s demographic transition. The White House proposals for immigration reform seem designed to do just that. According to an analysis from the Cato Institute, President Trump’s framework for immigration would slash entries by 44 percent, excluding almost 22 million people from the United States over the next 50 years. And in an analysis tied to the “Securing America’s Future Act”—a House-produced bill which hews closely to what the president wants—the Center for Global Development finds that white immigrants would be twice as likely to attain entry into the United States than black and Hispanic ones, while a majority of Muslim and Catholic immigrants would be barred from the country. Couple these measures with voter suppression, a biased census, apportionment by citizenship, extreme gerrymandering, and the existing dominance of rural counties in national politics, and you can essentially rig the system for the preservation of white racial hegemony. Immigration policy is inextricably tied to our nation’s self-identity. What we choose to do reflects the traditions we seek to uphold. In the 1920s, most Americans wanted a more homogenous country, and they chose accordingly. 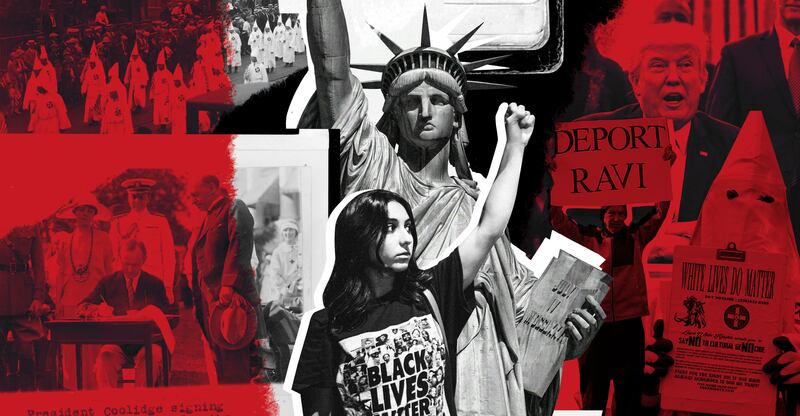 Forty years later, in the midst of the civil rights revolution and a powerful ethos of inclusion, Americans reversed course, opening our borders to millions of people from across the globe. In this moment, we have two options. We can once again take the path that wants to keep “America for Americans,” and which inevitably casts American-ness in ways circumscribed by race, origin, and religion. Or we could try to realize our cosmopolitan faith, that tradition of universalism which elevates the egalitarian ideals of the Founding, and which seeks to define our diversity of origins as a powerful strength, not a weakness to overcome.